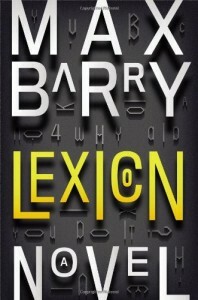 Lexicon is the rare book that I found both completely unpredictable and intensely thrilling. I’d call it a page-turner, but I listened to the audiobook version, so instead I’ll tell you that I was so enthralled that I spent the several hours just sitting on my couch listening so that I could finish it. That’s also rare – normally I only listen to audiobooks while I’m doing something else (dishes, chores, exercise, driving, etc.) – so I’d definitely call it a mark in Lexicon’s favor. Fans of Lev Grossman’s The Magicians will find much to enjoy here. Like that book, Lexicon tells the story of a school for talented youngsters that involves far more sinister and heartbreaking developments than ever graced the pages of Harry Potter. However, where The Magicians passes through pitch-black satire into chilling horror, Lexicon is equal parts paranoid “wrong man” thriller and cracked coming-of-age story, with constantly shifting motivations and alliances that hammer the fact that trust is a liability. In Lexicon’s world, language is a technology indistinguishable from magic, and the right words make it possible to control anyone as long as you know their psychological profile. A society of “poets” founded on these principles collects words of power and trains recruits in the art of persuasion at an exclusive private school. In the outside world, this society’s activities extend from brute force mental takeovers of susceptible civilians to more subtle campaigns of influence embedded in advertising or political websites. The book jumps between two primary story lines: the kidnapping, by poets, of Will Park, a middle-mannered man who is an “outlier” unaffected by their words of power, and the recruitment, schooling and eventual downfall of a seventeen-year-old con artist named Emily Ruff who joins the poets to escape her life on the street. At first, the connection between these story-lines isn’t entirely clear, and in fact they almost feel like entirely different books. Will is living in a paranoid thriller while Emily comes of age in a young adult novel with the occasional dark moment. However, the genius of Lexicon is the way Barry doles out revelations and slowly but surely pulls the rug out from under you. It isn’t long before the connection between Will and Emily’s stories starts to become clear, and you begin to wonder if Barry is actually doing what it seems like he is doing. Barry seems to delight in undermining expectations, and it’s oftentimes hard to know who to root for when so many of the characters take part in despicable events. Even still, I found myself drawn into their stories, wondering if my worst fears or dearest hopes might come true. I wasn’t entirely sure how the book might resolve itself until the very last moments, but that resolution didn’t feel any less earned because of it. There is the occasional minor plot hole, and one character’s stated motivations don’t completely make sense in the end, but none of that detracted from my enjoyment. Lexicon was an absolutely thrilling read, and I can’t recommend it enough. The funniest thing about Barry is that when I read Jennifer Government many years ago, I didn’t particularly like it. However, I’ve read two more of his books this year (Company was the other), and thoroughly enjoyed both. I suppose it just goes to show that you can’t always judge an author by a single book. I’ll definitely be checking out his other books soon.